I have worked in the senior care industry for the past seven years, most recently doing sales and marketing for a Boston retirement community. My days consist of giving tours of the campus, facilitating the move-in process, and hanging out with 350 bubbes and zaydes. Given that many of us will live well past the age of 90, I have picked up on a few things that we 20- and 30-somethings can do now to prepare ourselves for a comfortable and enjoyable old age. I occasionally cover the front desk, and when residents ask to make a quick call to a family member or cab company, they typically just recite the phone number. When was the last time anyone under the age of 35 did that? Our generation has virtually no need to remember anything! Cell phones store numbers, websites remember passwords and Facebook tells us birthdays. If I don’t use my memory now, what might happen when I experience even normal age-related memory decline? So I challenge myself to memorize things: my parents’ new home phone number, a short poem I recently heard, my grandma’s banana bread recipe, just to keep my mind sharp. Every Monday from 11 a.m. to 12 p.m., seven people shout answers at me as we attempt to solve the New York Times’ Sunday crossword puzzle. It’s my favorite hour of the week! Exercising the brain (and the body) is imperative for decreasing the chances of dementia. For more info, read this NPR article and listen to this TED Talk. I used to manage the guest house we operated for friends and family of our residents. One day, 91-year-old Irving asked how much the guest house cost per night. When I told him the price, he asked if there was a senior discount. He may have been joking, but getting older is not cheap. That’s why I take advantage of my company’s retirement benefits. I know that saving—even a little bit—will come in handy when I, God willing, reach Irving’s age. One of our residents recently displayed her massive pop-up book collection, ranging from fairy tales to baseball stadiums to Stephen King, in a campus-wide exhibit. With the rise of Kindles in particular and technology in general, I fear our generation will at some point only know how to use our eyes to look at screens and forget how to use our hands and minds to create things. That’s one reason I devote a few hours each week to my low-tech hobbies, including cooking, crocheting and creative writing. I look forward to the time when I retire and can churn out quiches, socks and personal essays all day long. I’m lucky to be surrounded by hundreds of seniors every day. From them I have learned how to knit a scarf, arrange flowers in a vase and cut to the chase. For those of you who don’t hang out with the 65-plus crowd on a regular basis, you can talk to a grandparent or find a volunteer organization like FriendshipWorks or Little Brothers – Friends of the Elderly to connect with a local senior. Find out what getting older is really like. As a bonus, you’ll also be fulfilling the mitzvah of honoring the elderly. It’s a win-win! May you live to be 120. 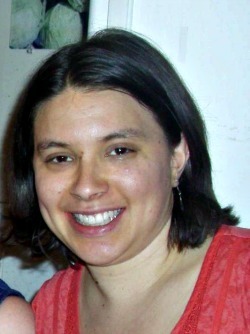 Elana Kieffer grew up in Providence, R.I., currently lives in Allston, and loves to visit her grandmother in the Bronx. She talks about her day job and hobbies in the above article.